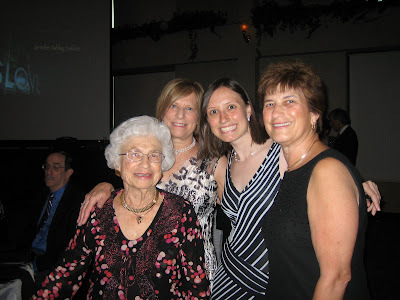 Grandma, mom, Amy & Aunt Esther enjoy the celebration. 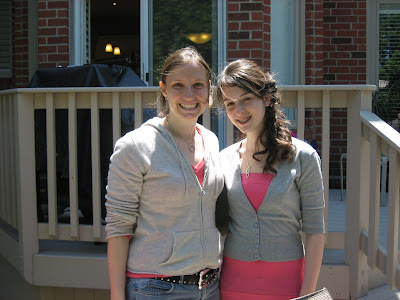 Over Memorial Day weekend I visited Toronto for the Bat Mitzvah of my cousin, Jenni. 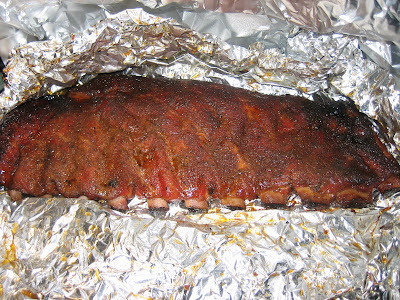 We had a fabulous time and lots of great eats. 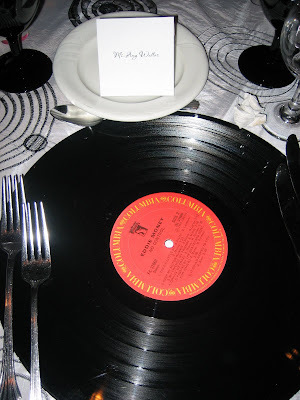 My placemat - a real record! 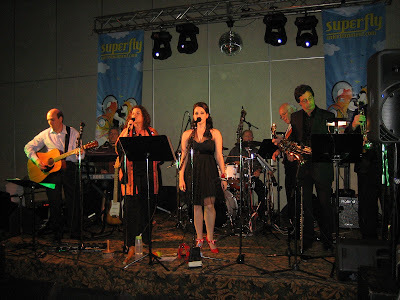 Cousin Alex singing with her dad, David, in the band. They provided some great musical entertainment. Julia and Amy - northern and southern cousins! 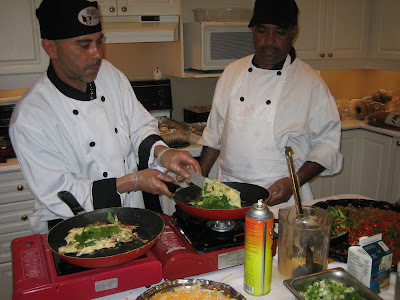 Sunday brunch = omelet makers at our cousins' house! 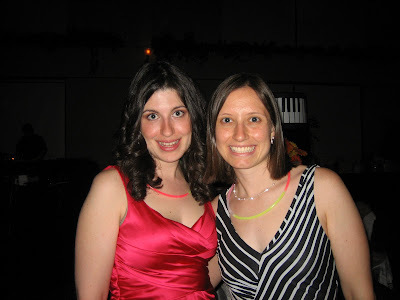 Amy and Jenni, the Bat Mitzvah, in coordinating colors! 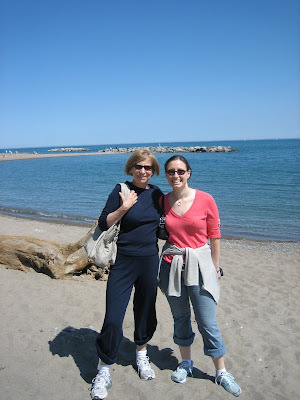 Mom and Amy at the Toronto beaches. Julia and Steven were nice enough to take us around town for a bit of a tour. 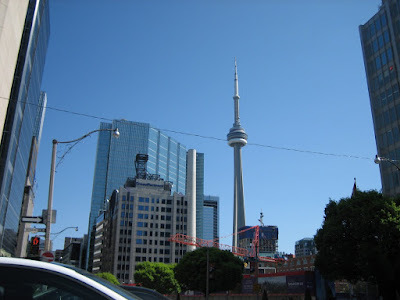 The Canadian National (CN) tower. 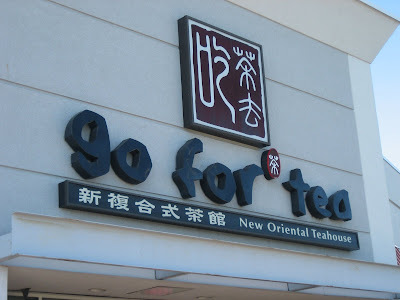 Sunday afternoon we stopped in at Go For Tea for a snack. 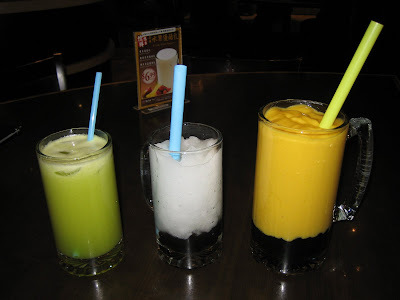 Pineapple/celery/lemon juice, lychee bubble tea and mango bubble tea. 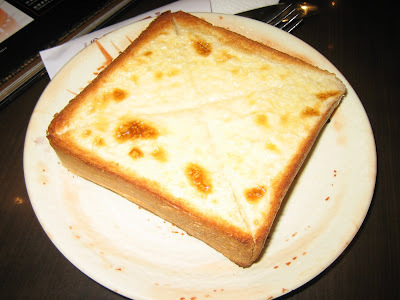 We also shared an order of condensed milk toast - sweet and tasty. 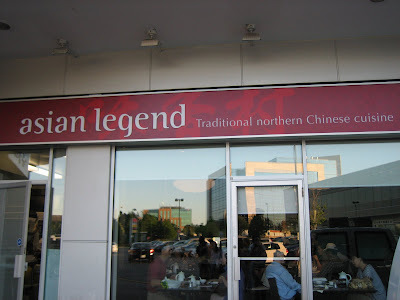 After a good nap we headed out to meet several of our relatives for dinner at Asian Legend Chinese restaurant. 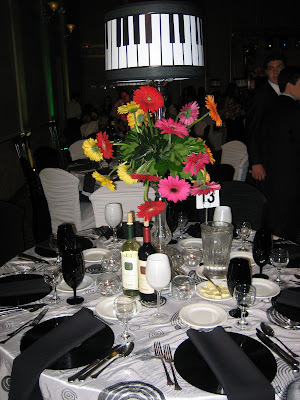 The place was packed and seating was a bit difficult but we managed to have a wonderful time and enjoy each other's company in spite of the challenges. 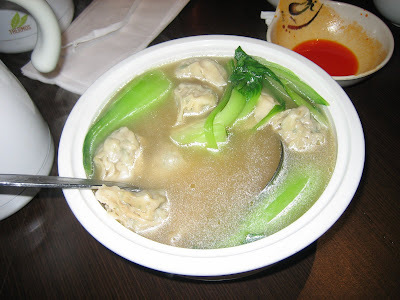 I loved the wonton soup, the shrimp dumplings and the eggplant! 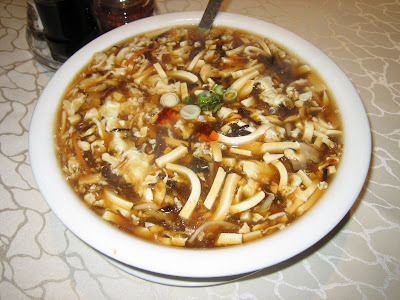 Veggie hot & sour soup. The next morning I found a delicious Chinese bakery near the hotel where I purchased some goodies for breakfast. Luckily, they accepted my US dollars! 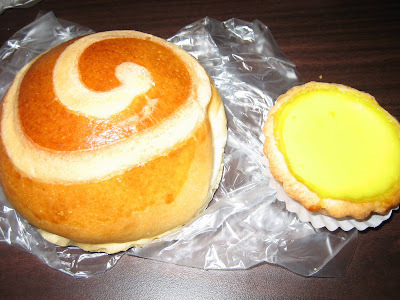 Delicious custard bun and egg custard tart from a local Chinese bakery. 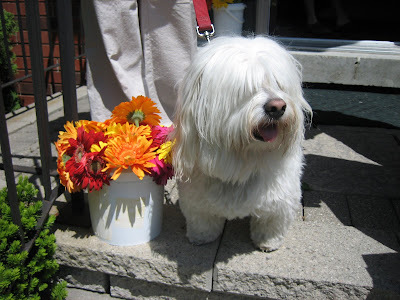 Jenni's cute dog! We had a great time in Toronto - can't wait to visit again next year! 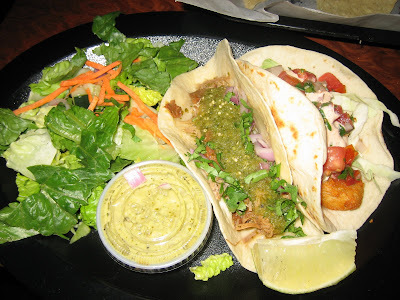 Carnitas and fish tacos with salad. 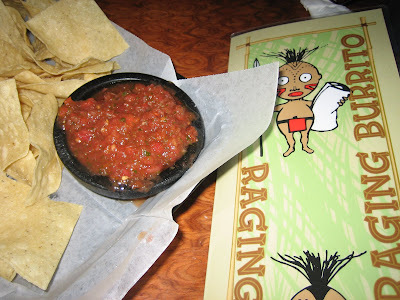 On Thursday I headed to Raging Burrito in Decatur for dinner. Trivia was going on, and it was lightly raining so we sat inside rather than on the cute patio out back. As much as we love trivia, this time we did not officially participate! I was a little annoyed that you had to order chips and salsa. To me, this is something that should be standard at any decent Mexican restaurant. I was also not happy with the native-looking person on the menu cover, wearing only a loincloth and holding a spear. Not sure how this fits, although I suppose they were going for something about "Indians" or "Mexicans" raging. I don't really get it, though, and actually find the image quite offensive. Anyone else feel this way or know more about the image's origin? 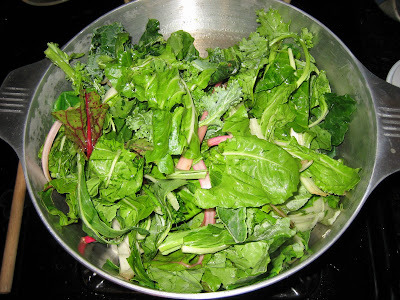 On to the food: my tacos were tasty as was the salad dressing. 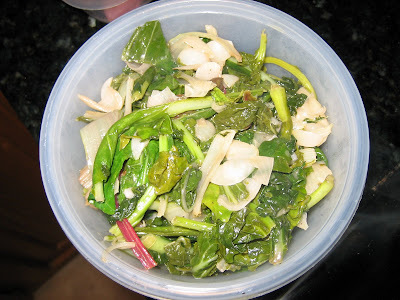 I liked that they offered the option of a side salad rather than rice and beans. 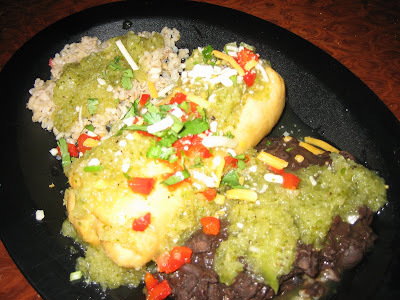 The tofu chimi was also tasty, with a pineapple salsa on top. 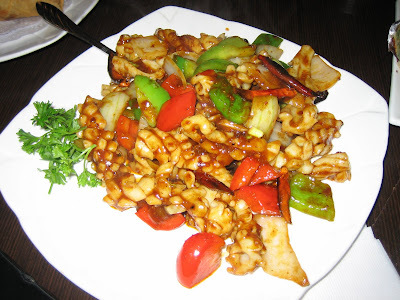 I found the portions to be small for the price, but really they were just right for my tummy and not overwhelming. Service was spotty but everyone working there looked like they were having fun. I will probably not return here in the near future, but if you crave Mexican in Decatur, it' s not a bad option. 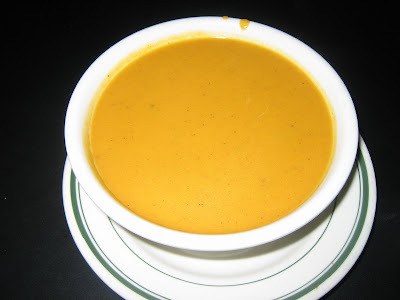 I'm still looking for my go-to Mexican place in Atlanta. Any suggestions? Noodle bowl of the day. On Monday work took me to Athens and since my paralegal and I were just finishing up business at 6:45 we decided to have dinner before making the drive back. 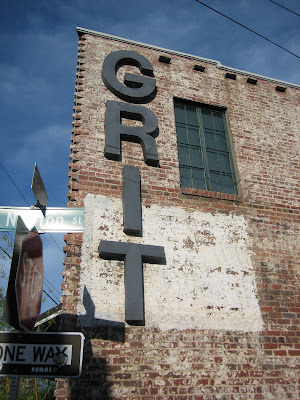 One of the partners in my firm, who attended UGA, recommended The Grit. 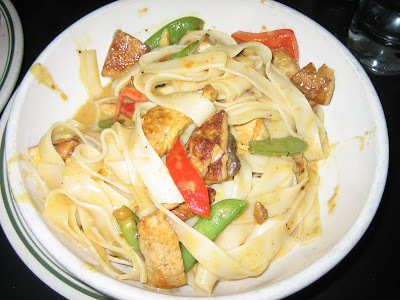 We thoroughly enjoyed our food there, especially the soup of the day (sweet potato, which had a very complex, slightly spicy flavor) and the noodle bowl (rice noodles, tofu, snap peas, mushrooms and red peppers in a red curry coconut broth). 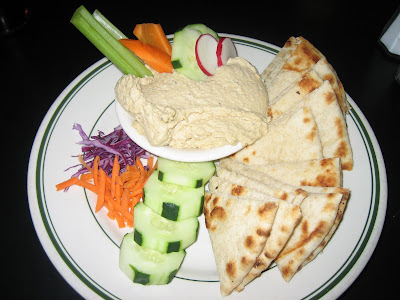 The hummus also tasted very fresh and flavorful. This is a great place to try if you're in Athens and need a quick bite. It's completely vegetarian although they do have some faux meat options like "chik'n" and veggie burgers. 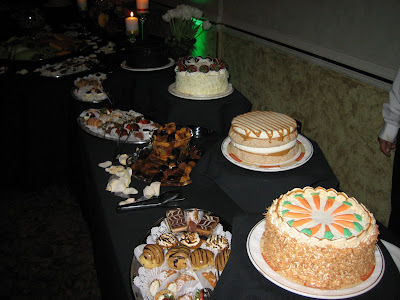 The desserts looked great, but we held back. I would love to try this place again soon. 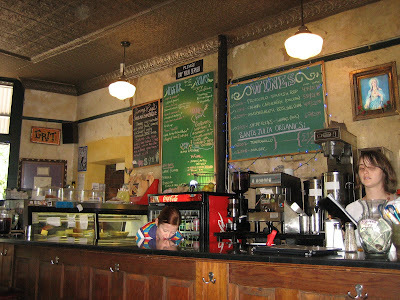 Athens afficianados - what are your favorite places to eat? 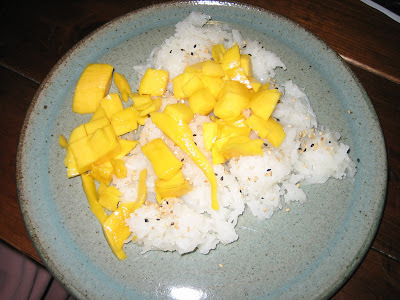 On Sunday my friend Thy called to let me know she had prepared sticky rice with mango. 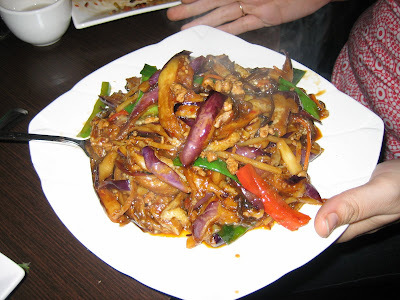 This is one of my favorite desserts, often served at Thai restaurants. She even made a coconut sauce to go over the sweet, sticky rice and she provided sesame seeds for sprinkling. This is the best sticky rice I've ever tasted. 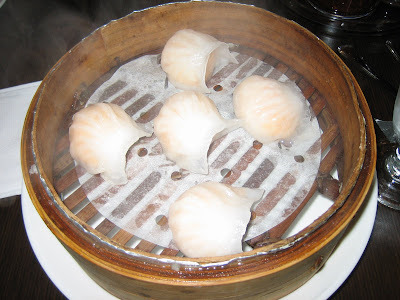 I have never made it as you need a steamer basket to make the rice properly. Thy - thank you so much! You are awesome. I really enjoyed the sticky rice! 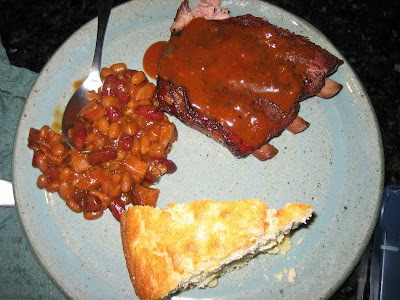 Ribs, baked beans and cornbread. 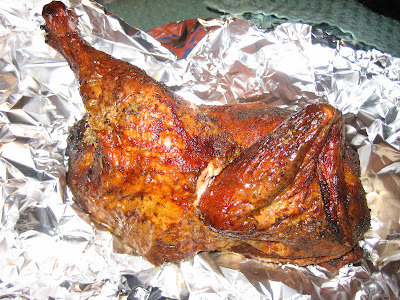 Chicken - crisp and juicy. 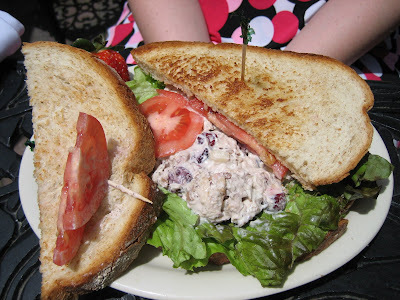 Last week I had a business lunch at Cafe Intermezzo near Perimeter Mall. There is also a location in Buckhead. 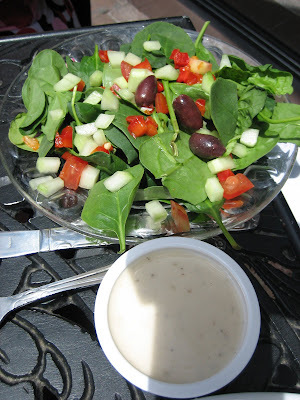 They have a wide-ranging menu including savory crepes, salads, sandwiches and entrees. Inside there are display cases with cakes galore! 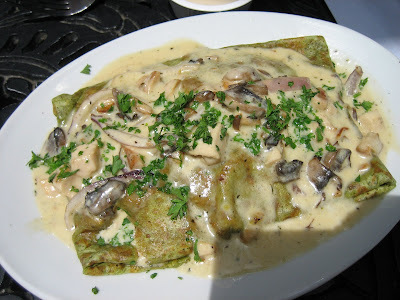 I did not sample the crepe or the Waldorf salad, pictured below, but both of my dining companions enjoyed their meals. 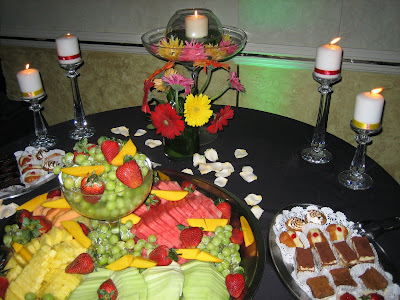 The turkey sandwich was tasty; I liked the addition of granny smith apple slices. 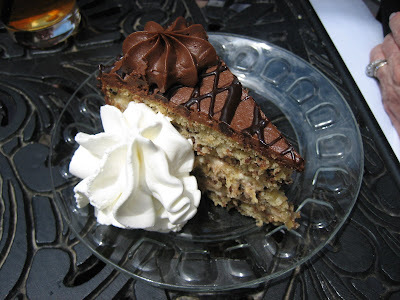 The banana chocolate chip cake was quite sweet and had good flavor, although not any better than my chocolate chip banana bread! 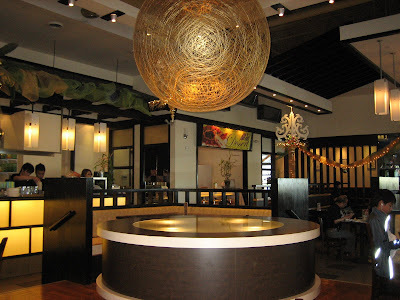 The atmosphere inside is nice, and there is a patio also. It has a real European feel, which is complemented by the foreign languages they play in the restrooms! Next time I will have to try one of the crepes. 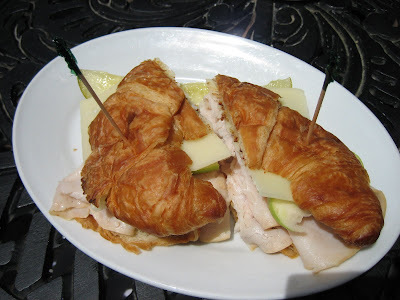 Turkey DeLuxe sandwich with swiss and apple on croissant. 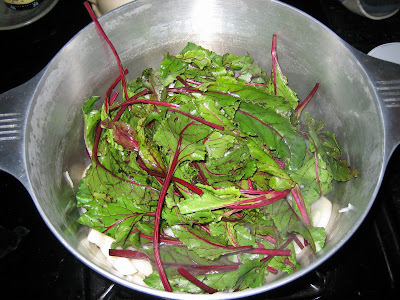 Braising greens and green garlic after cooking. 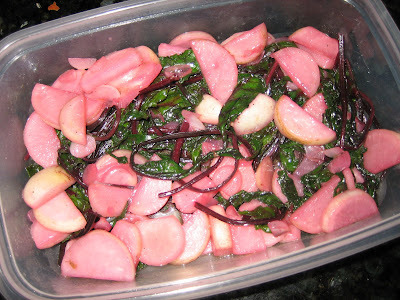 Beet greens and turnips, cooked. 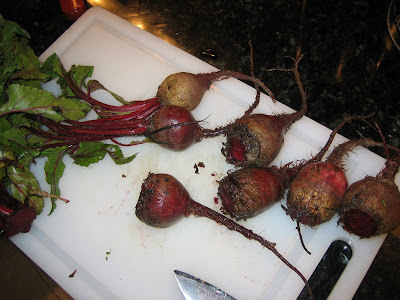 Believe it or not, the beets are not in here. 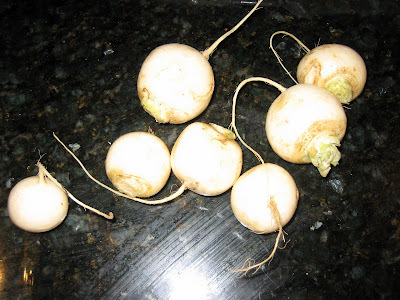 I roasted those separately and put them in salads.